percy waters – just a good tattooist! ‘Anniston’ would be more likely associated with a certain Jennifer than a place in Alabama and yet there is such a place in this state. 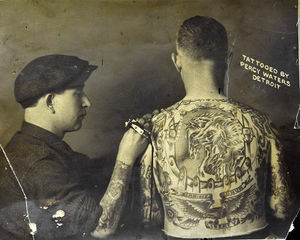 As it happened, there was one Percy Waters who lived there decades ago and he was, according to his own words, ‘just a good tattooist.’ This article from a local newspaper gave me goose bumps (in a good way) as I just love these spare morsels of early tattoo history and I would love to have such bits and pieces in the Polish tattoo history. Hopefully someone out there will also find it a good read. And to make it even better, let me link here to another tattoo history-related post about the early history of American tattooing. They’re quite lucky to have relatively well documented past in this regard!